Eye Catching Splat Floor Sticker. 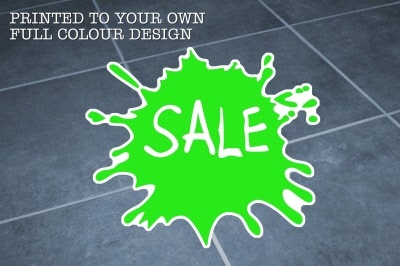 Customise the colour and text on the floor graphic for FREE. Artwork requested via email once the order has been placed. Floor Graphic is made from Peelable Non Slip Vinyl for Long Term Indoor Use (up to 12 months, subject to footfall) or Permanent Non-Slip Vinyl for Short Term Outdoor Use (up to 6 months subject to footfall). Minimum Online Order Quantity 5 Graphics. If you select "Other" as your splat colour please confirm the shade you require in the message to us field when placing your order at secure checkout.